The early Permian temnospondyl Archegosaurus contemplates its domain. This animal was about 1.5 meters long. Artwork by Heinrich Harder, from the card series Tiere der Urwelt (Animals of the Prehistoric World) circa 1916, Public domain. 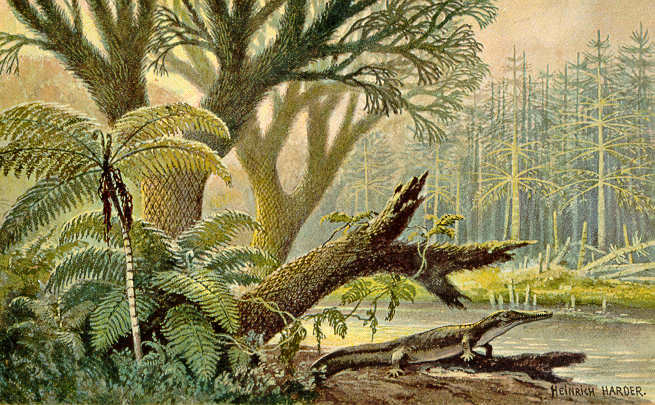 Masters of rivers, lakes, swamps and watercourses, and, for a period during the Permo-Carboniferous, the terrestrial environment, the temnospondyls were the most diverse and abundant of ancient tetrapods from the late Carboniferous to the Triassic. Filling ecological roles as diverse as toads, eels, crocodiles, and long snouted marine fish-eaters, as well as guilds and ecotypes with no current representatives, such as the bizarre suction-feeding plagiosaurs, they included among their number the largest amphibians ever to live, as well as medium and smaller and more typically sized forms. And, just as dinosaurs are still with us as birds, so temnosopndyls never really died out, if the favoured hypothesis that dissorophoids are the ancestors of modern amphibians is valid. Many more pages could be written about them than the uneven coverage provided by the few included here. So, for now, here are the amazing temnospondyls.